Reproduced with permission from AutoInc. Magazine, March 2014 issue. Over the past five years, health and safety officials across North America have increased their focus on vehicle service providers. This is in response to many factors, including an increase in employee personal injury litigation, a flood of untested products flowing into the equipment marketplace, and the fact that thousands of workers are treated for injuries each year. Health and safety officials that visit service facilities are there to make sure vehicle lifts are in good working order and all operators are properly trained. Officials rely on industry standards that address known shop hazards. The American National Standards Institute (ANSI) standards covering the lifts in your work bays are sponsored by the Automotive Lift Institute (ALI), an ANSI Accredited Standards Developer and Product Safety Certification Organization. By familiarizing yourself with the standards and implementing the following lift certification, training, maintenance and inspection best practices, you can protect your workers, while at the same time protecting your business against citations and fines. A commitment to preventive safety measures will set your shop apart from others and be obvious to any health and safety representative. The first step you can take toward responsible lift ownership is to purchase a product that has been third-party tested and certified to meet industry safety and performance standards. The standard by which lifts are certified, ANSI/ALI ALCTV-2011, provides safety requirements for lift construction, testing and validation. A certified lift’s design has been tested and continuously inspected by a National Recognized Testing Laboratory, or NRTL, as defined by the Occupational Safety and Health Administration (OSHA). Testing includes verification of the structural integrity of all the lift’s systems and components, proper function of its controls and loadholding devices, proper lowering speeds and overload protection. All ALI-certified lifts are required to have ultimate material strengths at least equal to three times – and for some components, five times – the stress they will be subjected to under normal rated use. While certified lifts are tested beyond their rated capacities, it is never safe to overload them. audits at least twice a year to ensure that program procedures are being followed. Once a lift model is certified, each individual lift is affixed with a gold label bearing the ALI logo. ALI’s gold labels can be found on all types of lifts, from heavy-duty inground models to two-post surface lifts. Most building code enforcement agencies across the United States and Canada mandate that only certified lifts be installed within their jurisdictions, to reduce the potential for workplace injuries. Since the certification process is voluntary for lift manufacturers, the responsibility for buying and installing certified lifts rests solely with the customer. 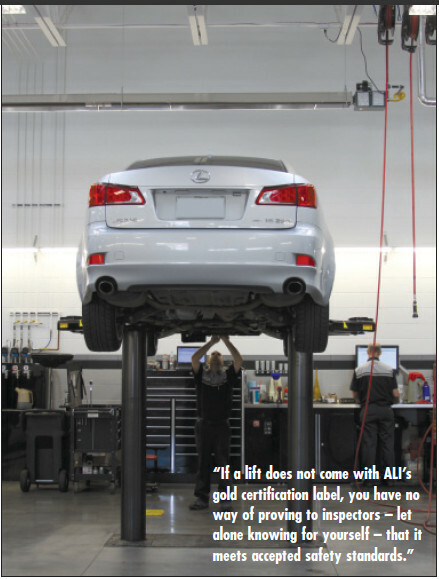 If a lift does not come with ALI’s gold certification label, you have no way of proving to inspectors – let alone knowing for yourself – that it meets accepted safety standards. Ask for proof that ALI’s Gold Certification Label is on the lifts you purchase before taking delivery. The buying and installation process is only half of the responsible lift ownership equation. Health and safety officials can still cite your shop if operators are not trained to use their lifts. Ask your lift installer to train your technicians on the proper way to operate and maintain the specific lifts you have installed. You can also provide users with general vehicle lift safety training with the convenient Lifting It Right: 2014 Online Edition program from ALI. 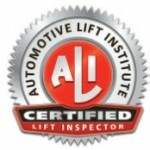 This new interactive, Web-based training can be purchased at www.autolift.org/store.php#lift ingitright. scenarios with corresponding questions are presented to engage participants, who interact with the content and receive immediate feedback when answering the questions. The interactive elements provide a positive learning environment and reinforce the trainee’s understanding of each topic presented before moving forward. At the conclusion of the program, a certificate of completion is generated and stored online for those who pass the online test. With online records, there are no worries that a certificate will be lost or misplaced. If a safety inspector visits your shop, you can quickly and easily demonstrate training compliance by pulling up each employee’s record online. that they are properly certified and installed, but that they function correctly. To keep your lifts functioning as intended, it is important to regularly maintain them as outlined in each lift’s owner’s manual. Teach your technicians to check their lifts daily prior to using them. If they are unsure of what to look for, ALI’s Lifting It Right program (can be purchased at www.autolift.org) provides some basic guidelines. The material covered in the program includes the following examples. For two-post and inground lift telescoping arms, check the over-travel stops for wear, swivel points for sufficient lubrication and metal pieces for stress cracks, breaks in need of the best welder or permanent bending. Cables and chains should be free of debris and serviced professionally if excessive slack is present. Salt, sand, water and dirt can work their way into plunger housings and bearings, so make sure the lift is washed regularly and corrosion is taken care of as soon as it is noticed. Hydraulic lifts should be checked regularly for proper fluid levels, clean seals and properly connected lines. In addition to practicing daily maintenance, be sure to follow all recommendations provided by the manufacturer. Since maintenance intervals vary by lift, you may have to adjust your routines when purchasing new lifts. launched North America’s first Lift Inspector Certification Program in October 2012. Sincze its introduction, almost 100 individuals across the U.S. and Canada have earned certification and even more are in the process of completing the program, making it easier than ever for lift owners to find trustworthy inspectors and demonstrate compliance with the standard’s requirements. inspect any vehicle lift to demonstrate compliance with OSHA’s General Duty Clause, as well as provincial requirements in Canada. 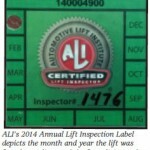 Certified Lift Inspectors apply a dated ALI Annual Lift Inspection Label to each lift that passes inspection, making it clear the lift has been assessed within the year. To locate an ALI Certified Lift Inspector in your region,visit www.autolift.org/inspectors.php enter a U.S. ZIP or Canadian postal code and select a geographical radius. Each entry includes the inspector’s individual certification number, company, contact information and photo. from health and safety officials. Your equipment should last longer, you will decrease the likelihood of experiencing downtime due to employee injury and, most importantly, you could even save someone’s life. R.W. “Bob” O’Gorman is the president of ALI. For more information, visit www.autolift.org.